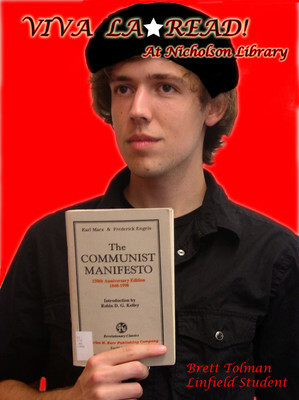 Brett Tolman, Linfield student, class of 2010, reading The Communist Manifesto, by Karl Marx and Friedrich Engels, with an introduction by Robin D.G. Kelley. Terry, Paula and Nicholson Library Staff, "Brett Tolman READ Poster" (2008). READ Poster Gallery. Image. Submission 14.